Dr.J. Lakshmi Jeya Swaruoopa is the disciple of Kannan M, the legend in name numerology. She understood how the power and the vibrations of the names transform people's lives and make them successful. Dr.J. Lakshmi Jeya Swaruoopa did her own research into people's lives who had different numbers, how it controlled their characteristics and how numbers decide people's destiny. She found out Kannan M's discoveries to be the most accurate since a name can attain full success only when the vibrations are positive. Dr.J. Lakshmi Jeya Swaruoopa is a very successful and very popular Name Numerologist in Tamil nadu enlightening people through TV shows in very famous satellite channels around South India & has experience of serving clients over 25 years alongside the genius Kannan M.
So many cinema stars, sports stars, politicians and other well known personalities in South India are very grateful clients to her for their success and consider her their ultimate good luck charm. Dr.J. 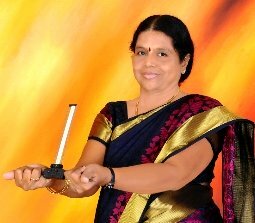 Lakshmi Jeya Swaruoopa is trained by the No.1 Bioenergitician in India Kannan M. She uses Lecher Antenna to measure the name's good and evil vibe. She believes this is the most accurate and scientific way to get 100 percent perfect lucky name.